What happens when the director whose work you're scoring isn't satisfied, or demands changes due to events beyond your control? We find out, and also look at writing music for film trailers. Some people say that change is a good thing, but as a music-for-picture composer, I sometimes find myself wishing that everything I write could be used without the need for any changes. Whenever I start thinking like this, it's usually not too long before I get a rude awakening; as we've seen, change is often the first order of business. The director can suddenly decide that completely different music is needed, or make new edits to the visuals that throw off all of your precisely calculated tempo changes. Last month, we began to discuss how to deal with revisions, and you should now have had a chance to try scoring the opening scene to the short film Ghost Soldier. It's time to explain what I wrote, and continue the tale of the short film that kept getting shorter and shorter. When I first sat down to write the opening cue for Ghost Soldier, I thought carefully about my conversations with director Allan Tsao. As I explained last month, Allan had assured me that the temp music in the rough cut he had shown me was merely filler and not significant. However, experience has taught me that temp music is not likely to be written off easily, whatever your client may tell you. While Allan was eager to discover my perspective on the scene, deep down I felt that I hadn't heard the last of the temp track. I decided the best route to take was to come up with two ideas, and one of them would be based on the temp music. The score in my first attempt — which you can hear in the Quicktime movie ghostafterv1.mov — is heavy on sound design. I found Spectrasonics' Atmosphere indispensable for this. I had chosen to score this piece in MOTU's Digital Performer, and loaded up a number of sounds that were in the same genre as the sounds in the temp track. Besides Atmosphere, I used some hardware synths that I continue to find useful, including the Roland JD800 and JD990. And I loaded up some Taiko drums from East West's Stormdrum library as well. The first minute or so were my own ideas that I felt set up the film nicely. After that, I began to move musically in the direction of the temp music. The score for Ghost Soldier's opening sequence (or the first version of it...! ), as seen in MOTU's Digital Performer.Photo: Jodi KaplanOne of the major challenges of this scene was dealing with the different locations and changes in time. The film begins in Iraq, jumps back in time to childhood memories, fasts forwards to the present back home, jumps back to Iraq and finishes with a bittersweet moment from childhood — all in the first two minutes of the film. Yikes! Version 1 of my score opens with the 'Taikos Earthquake' patch from Stormdrum (see the screenshot opposite). Following that is a layer of patches from Atmosphere including 'Chill Factor', 'Ancient Extinction', 'Coming Unglued' and 'Angelic Morph'. I also used the 'Adagio' strings preset, which has a more distant sound than my usual choice for strings, VSL's Opus 1 library (which I used in version 2 of this score). The idea was to create a slightly dark, ethereal ambience to introduce the film. Following that would be a melodic motif representing longing for the past. This section somewhat resembled the temp track. As an alternative, I took a completely different approach in version 2 ghostafterv2.mov. This version would be more symphonic in scope, utilising string orchestra, woodwinds, snare drum ensemble and tam tam, children's choir, and instruments native to the Middle East. This version would be slightly more 'epic' in its approach. I made some use of sound-design elements in this version, and kept the 'Taikos Earthquake' patch used at the beginning of the previous version. The orchestral sounds came from the VSL Opus 1 library, the voices from Spectrasonic's Symphony Of Voices library and the Middle Eastern sounds were derived from East West's Ra and Ilio's World Winds sets. When Allan showed up to listen to the tracks, he listened to them once and immediately remarked that they didn't sound close enough to the temp track. Now, I had spent an extraordinary amount of time on these tracks, and wasn't particularly pleased that they had been written off inside of five minutes. We listened again, but still Allan wasn't sure that my efforts were going in the right direction. What followed was an epic struggle over how close we could reasonably get to the temp music (which, being a copyrighted commercial composition, could not be used as it was). While I agonised over the revisions, Allan continued to cut and re-cut the film. After another week, I was presented with a new cut with new temp music. The original temp music no longer worked, and it was time to change direction again. The battle over temp music continued further into the film, and I did my best to accommodate the desires of my employer while also making my own creative contribution. As I've mentioned a couple of times, clashes like these are not necessarily because what you've written is wrong or inappropriate; many times directors are simply used to hearing a particular music track accompany visuals that they've painstakingly put together during months of editing, and new music seems foreign to them. As Allan continued to edit, my tracks began to grow on him, and he slowly began replacing the temp tracks with mine. By the time he was finished making changes to the picture, he could no longer imagine the temp tracks working at all and only my tracks seemed to fit. That, of course, was my ultimate goal, and it should be yours in similar situations! You can download the final version of the opening scene from ghostafterfinal.mov . Allan had trimmed at least 40 seconds from the opening scene, and the flashback scenes from childhood were pushed further into the film. In fact, the entire film was trimmed some five to six minutes, which is significant for a short film. The musical direction we eventually settled on was derived from the first 30 seconds of my first version. Ultimately, the entire score combined the sound-design elements of the first version and the orchestral and Middle Eastern elements of the second. The dreamlike synth motif of the first version was altered and used later in the film, and for the closing credits. Narrow Gate Producer Sarah MacAllister 'on set' as lead character Sarah Weber.Photo: Jodi KaplanWhile it is not unusual to go through a process such as this to achieve the desired results, there was another twist to the story. Most composers prefer to work in isolation, locking themselves away in their studio and not coming out until depleted of ideas. And for the most part, this is how I work as well. For a significant portion of this score, however, I worked on it with Allan sitting in the studio next to me. There are distinct advantages and disadvantages to this method. On the one hand, it can be a huge timesaver, as having immediate feedback on the score can keep you focused on the what the director wants, and avoid you wasting time on a direction that will not be well received. On the other hand, it can be awkward to have someone in the studio during those moments when inspiration has taken a coffee break. And speaking personally, being a guitar player with lousy keyboard skills, it can be downright embarrassing to have someone sitting there while I hit one clunker after the next. It can also take a while for an idea to come to fruition, as the layering of parts from the bottom up can take considerable amounts of time. Objections may be raised before you've had a chance to finish the thought. My experience as a sound designer and post-production sound mixer helped immensely here, as I'm used to having clients in the studio tossing out suggestions. On the whole, things went very smoothly, and in the end, we had a score that met the director's criteria and gave me great artistic satisfaction. However... the story doesn't end there. As I write this article, Allan has decided to further edit the film after screening it to test audiences (all of the feedback has been extremely positive; he merely wants to make it an even stronger film than it already is). Consequently, it now seems that the opening scene will be trimmed again. I'm currently waiting for the new 'final cut' and have to score yet another version! Sometimes working in the music-for-picture game can be a slow, fraught, and difficult process, but at other times, you're utterly captivated by the project you're working on. One of the most rewarding moments of my professional career was being a part of the soundtrack recording for the Martin Scorsese remake of the film Cape Fear. I was an engineer at BMG/RCA Studios in New York at the time, and I was fortunate enough to work with a number of people I had great admiration for. First of all, the music was a new orchestration by Elmer Bernstein (who also conducted) of Bernard Herrman's original score (Hermann, of course, is another hero of mine). Secondly, getting to work on a Martin Scorsese film that starred Robert De Niro, Nick Nolte and Jessica Lange was a major treat. And finally, I got to work with one of the best Hollywood scoring mixers in the business, Shawn Murphy. Working in the famous RCA Studio A, the orchestra was recorded primarily with the classic Decca Tree microphone setup, utilising three vintage Neumann M50 microphones. Those of us who work mostly with virtual orchestras yearn for the day when we have an orchestra of this size at our disposal. As advanced as virtual orchestra libraries are today, they cannot recreate the beauty and warmth of a talented orchestra playing in a fabulous-sounding hall and being recorded by an expert engineer. It was also truly educational to witness a great film composer and conductor working his magic, bringing the notes on the page to life and adapting to changes on the spot (you try making alterations to a score with 60 musicians waiting for you and one of the world's greatest directors sitting patiently on the studio couch!). You can't pay for experience like that, and I'll never forget it. We're going to switch gears a bit for our next film, The Narrow Gate. 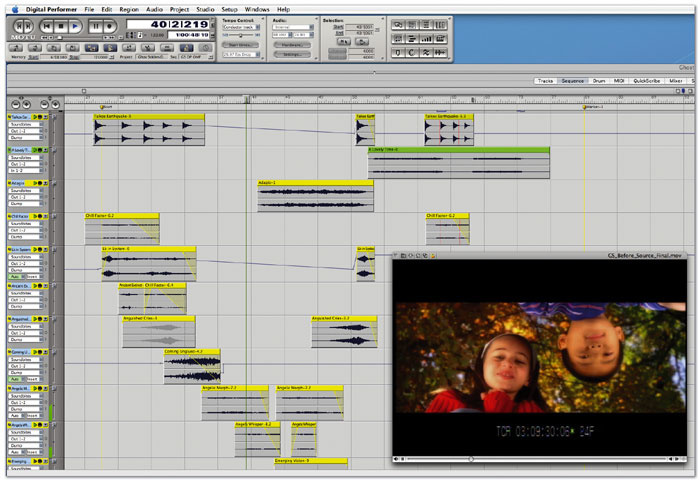 It is not entirely uncommon that the Producer for a film will exercise creative control of the post-production process (editing, scoring, sound design and mixing), rather than the Director. For our next film, this is exactly what happened. And we'll be looking at scoring the movie trailer, rather than the film itself. Trailers represent another potential income stream for aspiring composers, and as we'll see, there are a number of different circumstances to consider that differ from what we've previously discussed. The Narrow Gate is a feature film written and produced by Heather MacAllister, who also plays the lead character in the film. Heather has previously produced an off-Broadway revival of Neil Bell's Two Small Bodies, and is currently producing a feature film by filmmaker Paul Stone about New York's Times Square in the 1970s. In addition to performing the lead role of Sarah Weber in The Narrow Gate, Heather starred as Cathy in the short film All Souls Day, as well as roles in the films The Right To Remain and Death Of A Dynasty. Her television work includes roles in Law and Order and The Sopranos. Heather is also drafting a new script for an upcoming feature-film project. Unlike the previous films we've discussed, this film was secured as the result of a prior working relationship (they say you're only as good as your last job...). I met Heather while working on the short film All Souls Day, written and directed by Laura Storm, who also directed The Narrow Gate. Heather also played the lead role in that film, and I did the sound design and post-production audio mixing. While my initial role did not involve scoring outside of a few short guitar-based underscores, I volunteered to compose a few extra pieces after spending time working with the film, and one of those pieces was used for the closing credits. Barely six months later, Laura and Heather called to hire me for The Narrow Gate, taking me on to compose an original score, provide sound design and mix the final audio. I began by meeting Heather to look at a rough edit of the film. She didn't have any specific musical directions, other than a strong preference for piano and string orchestra, and no temp tracks were used during the editing process. One of the real challenges of the film was to accommodate the emotional complexity of the story line. First of all, there was the delicate topic of the September 11th terrorist attacks. This is certainly something that needed to be treated with great care; politics is best not discussed at the dinner table, and should also arguably absent itself from movie scores. I have my own feelings about that day, but needed to be careful; the musical focus had to be on what the film was trying to say. And at the same time, musical accommodation had to be made for the lead character's growing paranoia after the attacks, the breakup of her marriage, her developing friendship with a Muslim woman, and the gradual descent into despair of one of the supporting cast members who would play a critical role at the conclusion of the film. Despite this complex plot, and as we've discussed previously, it's always important not to have too complicated a score. I try to keep the number of 'musical characters' to a minimum, especially in an involved story like this. The piano played a significant role in more intimate situations, while the orchestra carried the larger-scale themes. I also used some Middle Eastern instruments from East West's Ra library, with haunting vocals by vocalist Smadar Levi, who specialises in traditional Middle Eastern music (while The Narrow Gate is set in New York, the producer wanted to include some musical references to the Middle East, given the subject matter of the film). However, the example I'm introducing this month comes not from the main film score, but from the film's trailer, which I was also in charge of scoring. Scenes from The Narrow Gate (clockwise from top left): lead character Sarah Weber and her daughter are deeply affected by the events of September 11th, 2001, which play out in the background of the film. They meet and befriend Safiyyah and her son, and through them, Sarah encounters Safiyyah's brother Rasheed, whose life has also been turned upside down, not directly by the attacks on New York, but by its follow-on effects.Photo: Jodi KaplanThe Narrow Gate is one of the first feature films to tackle the complex issues surrounding the events of September 11, 2001. However, its main themes are not the blockbuster, epic moments of burning buildings and crashing aeroplanes. Instead, it is a sensitive exploration of the reaction of average New Yorkers to the events as they unfold. The film follows the story of pregnant housewife Sarah Weber as she becomes obsessed with the events of that day while struggling to deal with the breakup of her marriage. Her paranoia escalates as she begins to imagine terrorist acts all around her. After witnessing a hate crime against Safiyyah, a Muslim woman, she becomes acutely aware of the bigotry and bias of her friends and family, and begins a friendship that expands her understanding and dampens her paranoia. Through this friendship, Sarah meets Rasheed, Safiyyah's brother, who himself begins a dark descent into frustration and desperation as a result of unemployment and bias following the terrorist attacks. Through a chance encounter, Sarah and Rasheed find themselves confronting a difficult choice that could affect their lives, and those of the New Yorkers around them. The Narrow Gate was shot on Super 16mm film and directed by Laura Storm, with beautiful cinematography by Christopher La Vasseur. Movie trailers are handled in a number of different ways; some companies even specialise in providing stock music for trailers. One reason for this is that trailers are often cut before the composer writes a note for the film. It is also not unusual that a different composer may be hired to score the trailer, depending on who is engaged to produce the trailer. In this particular case, I was asked to do both. Movie trailers are essentially advertisements, and exist to generate interest in a film. Usually they display the film's most dazzling elements to draw the viewer in. It would be fair to say that certain liberties are taken when editing movie trailers, in an attempt to create as enticing and exciting an experience as possible, and the music for a trailer may or not reflect the music used in the film itself. The bottom line is to sell the film in any way possible. The trailer for The Narrow Gate, which you can download from narrowgatebefore.mov is edited in such a way as to tease the viewer with snippets of the film, presenting a broad representation of its content. While the musical direction for the film was a combination of piano and string orchestra, it was more appropriate to use the latter in this case, as the producer was looking for maximum impact. The stage is set with a few scenes of New York City on the morning of September 11th. It then jumps around in the film with a few scenes of the main characters discussing their feelings after that day, followed by pace-quickening scenes of Sarah Weber's paranoia as she seals the air vents in her apartment and stocks up on gas masks and duct tape. Finally, we have the depiction of events in Sarah's life on the day of the attacks, as well as a scene with a small child screaming for help in a car trapped in a tunnel, and a stark shot of an aeroplane flying over the city. The visuals build to a climax as the trailer goes to black and we hear the voice of the lead character shouting "oh my God!" All of this, in roughly 60 seconds! Changing tempos so that a significant musical change falls on the first beat of a measure in the score.Photo: Jodi Kaplan Calculating tempos to accommodate cuts and hit points in film scoring can be an involved process. Luckily, we can simplify the process using markers in our sequencers. By placing markers at key points (the ones where we want a significant musical change or dramatic emphasis), we can manipulate our tempo in order to get the marker to align with the desired point. To do this effectively, we must lock the markers so they don't shift when we make a tempo change. 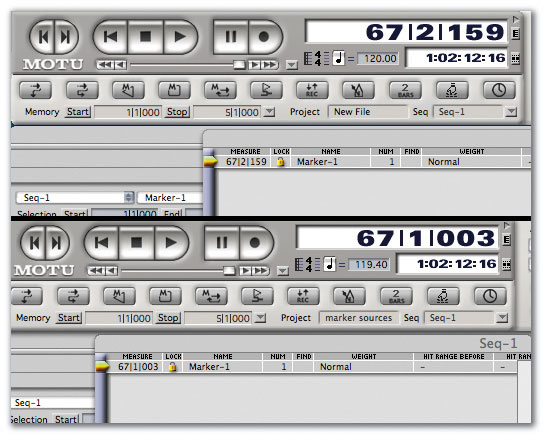 In Digidesign's Pro Tools, markers are locked to their creation time; so a marker created to denote a significant visual event at a timecode reference of (say) 1:02:12:16 doesn't move if you change the tempo of the music happening at that point. However, in other sequencers, such as Digital Performer, things work differently. Assuming the start time of our film is 1:00:00:00, and that the sequencer's time base is 480 ticks per quarter note, a tempo of 120bpm will place us at 67/2/159 (that is, bar 67, 159 ticks past the start of beat 2) by the time that same timecode value, 1:02:12:16, rolls around. This isn't a very convenient spot for a musical change; in sequencing terms, it would be preferable for that important timecode reference to fall on the first beat of measure 67. But how do we achieve that? 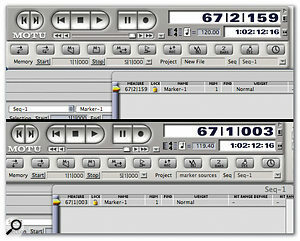 In Digital Performer, you do it by opening the Markers window and clicking in the Lock column to the left of the marker name (see the screenshots below). Now you can make slight adjustments to your tempo while watching your markers window until the marker is aligned to measure 67. In this case, we need to lower the tempo to just over 119bpm (199.40, to be exact). Now we've got a tempo that brings us to the first downbeat of a measure, making for an opportune moment for a musical change (OK, not exactly — it's 67/1/003, which is close enough for demonstration purposes). 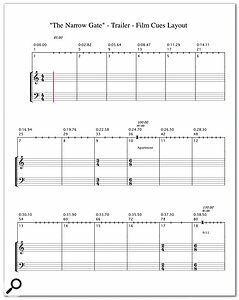 Digital Performer also offers more sophisticated methods for calculating tempo changes to accommodate various hit points. However, this method will work with most sequencers, and is a quick and effective means to accomplish the task. When preparing to score a scene in a film or a promo or trailer, it can be helpful to lay things out before you get started. 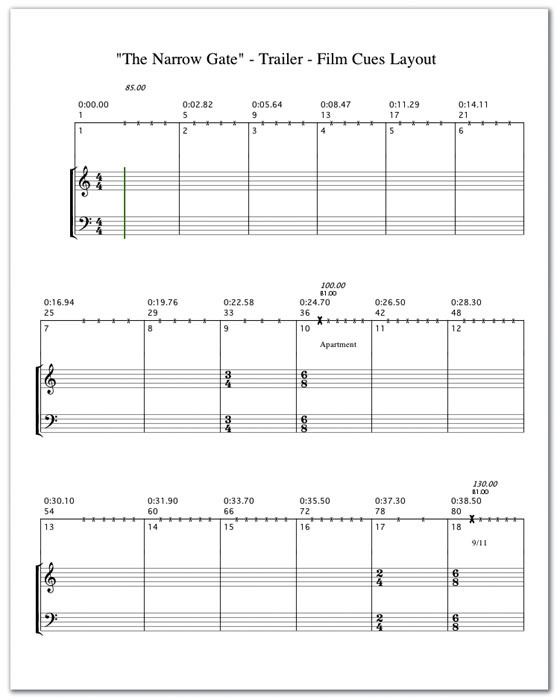 Some programs such as Digital Performer allow you to create a Film Cues layout to print out as an aid to scoring (see below for an example). This serves as a guide to the location of any significant changes that are desired, noting the specific time, tempo and musical bar/beat reference of each occurrence. In this case, after importing the supplied Quicktime movie of the trailer into Digital Performer, I created markers at the points where I felt there would be a significant musical change, breaking the trailer up into three sections. A marker is simply a point in time that you can give a name to. They are handy for moving quickly around from section to section in your score, but more importantly, they can help you to calculate an appropriate tempo. In this trailer, most scenes fade in and out of black. This allows for some additional 'wiggle room' when calculating tempo and bars and beats so we can end up on downbeats when making changes. Looking at the trailer, the first significant change occurs at roughly 24 seconds. At this point, it's important to increase the tempo as we see the lead character obsessing over news reports. Photo: Jodi KaplanThe next big change occurs at roughly 38 seconds (I say roughly, because at these points the picture fades to black). We see Sarah desperately trying to make a call on her cell phone after the terrorist attacks. Finally, at 56 seconds, we see the aeroplane fly over the city, and hear the roar of the engines before cutting to black. If you can't tell that this is an important moment that calls out for some kind of 'sting', or significant musical event, it's time to start looking for another career! This is the peak of the trailer, the point to which everything builds up, and since dialogue follows it, it may be best to let the sound ring out. Sometimes your client will be very specific about where musical changes are to be made. Other times, you need to use your best judgement and make the change where it makes the most sense with the visuals. Once you've finished adding your markers, you can start playing around with tempos. Make sure you lock your markers — in other words, you need to anchor them to their actual creation time, so they won't shift as you change the tempo (for more on this subject, see the box above). It's likely that when you first create your markers, your sequencer will be set to its default tempo, possibly 120bpm. And your markers are unlikely to fall on any downbeats in your sequencer (unless you've been plain lucky). While working with a rough idea of what my tempo should be, I make subtle adjustments to ensure that my next marker occurs as close to a downbeat as possible. In this case, I chose to use a tempo of 85bpm, which would place my next marker on the fourth beat of the ninth measure. As I prefer to keep things neat and simple, I'll often enter a meter change in my sequencer at the measure before, so that I'll end up on a downbeat of 1 with my next marker. By entering a meter of 3/4 at the ninth measure, my next marker (labelled 'Apartment') begins on the first beat of measure 10. At this point, knowing I needed to increase the tempo, I settled on a tempo change to 100bpm and a meter of 6/8 to accommodate the musical motif I would use here. As that would put my next marker at beat 5 of bar 17, I added a meter change of 2/4 to place my next musical change on the downbeat of bar 18. This is but one way of many to approach coordinating tempo and markers in your score so your music is in sync with the film. All sequencers have some capacity to add markers and tempo changes, and some are more flexible than others, but you'll have to read the manual and learn what's possible with your sequencer of choice. The style of music you choose will also play a larger role in dictating the flexibility you'll have to make changes. It is certainly easier to manipulate tempo if you're scoring without a defined beat, such as a drum loop. Your mission (should you choose to accept it...) is to score a big, bold musical event that will help drive customers to see the film. The version of the trailer I've given you to download contains only dialogue and sound effects; it's just as I received it. By all means refer to my Film Cue list on the left (or create your own), and be sure to use a full orchestra, as requested by the client. Build your tempo progressively, and make sure you have a big pay-off at the finish. 2 weeks 23 hours ago.